See the Solo: A Star Wars Story trailer here, out in cinemas on May 25th! After months of keeping fans guessing and waiting, the very first teaser for Star Wars spin-off movie Solo is here! A teaser video was shown during an advertisement break during the Superbowl but the whole trailer has now finally landed and it has some fans very excited! 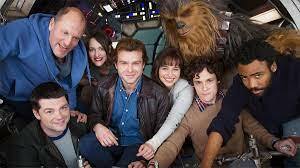 Solo will focus on a younger version of the character than in Star Wars films, which was originally played by Harrison Ford. The ‘new’ Solo is played by Alden Ehrenreich. The trailer also features the Millennium Falcon, undamaged from its adventures around the universe. The movie, called Solo: A Star Wars Story is expected to come out on May 25th 2018.